Taiwan's organic chemicals maker Luminescence Technology (Lumtec) launched a new company called Lumlight to develop and produce OLED Lighting based products. 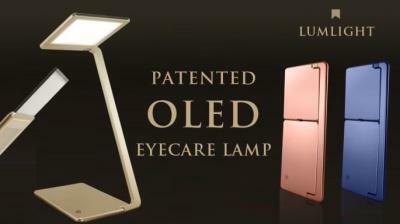 The company's first product is the OLED EyeCare Lamp, which uses an OLED panel to provide a healthy light source. Lumlight launched a crowdfunding campaign with an aim to raise $120,000 HKD (about $15,000 USD). The EyeCare Lamp is a desk lamp that uses a single OLED panel. The OLED features a lifetime of 30,000 hours, a color temperature of either 3000K or 4000K, a CRI of >90 and an efficiency of 60 lm/W. The brightness is 450 lux. The lamps themselves are foldable and the OLED panel is replaceable, which is a nice feature. In fact this feature allows the lamp to use panels from either Lumlight, OLEDWorks or Lumiotec - even though these have different sizes. The price of the EyeCare Lamp (for Kickstarter backers) is $148 USD.